Develop strength, speed and leanness with the Sunny Health & Fitness No. 077 Home Squat Machine. 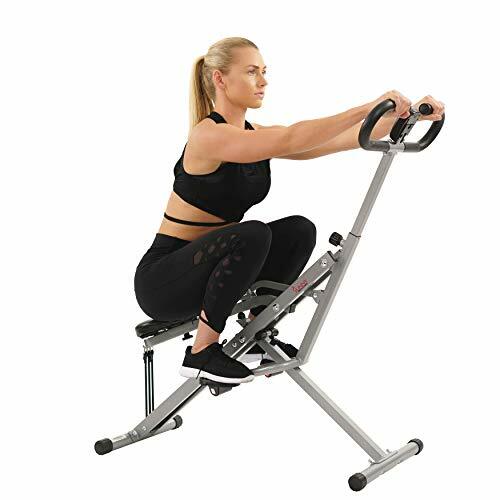 Strengthen not only your lower body but your shoulders, arms and back, this exerciser promotes compound movement (two or more muscle groups working cohesively). Activating groups of muscles together requires more strength, so you'll burn more calories. Compound exercises bring compounded results! With 3 adjustable resistance bands, intensify your workout by adding or subtracting bands, each band adds approx. 22 pounds of resistance! SQUAT ASSIST MOTION: Work your glutes, quads and hamstrings...just like a real squat. The handlebars provide stability and safety while squatting down. ELASTIC BANDS: Changing up the resistance levels will challenge your body and keep your routine fun and versatile. Each band adds about 22 pounds of resistance. TRACK YOUR FITNESS: LCD monitor tracks your calories, scan, time and count. WORKOUT VARIETY: Not only does it offer the ability to do a full-range squat but you can also add variety by doing high, median and low zone squats pulses. HOW IT WORKS: Isolate the core and activate the glutes. Tone the lower body by using your glutes, quads, and hamstrings to push yourself down to a squat.